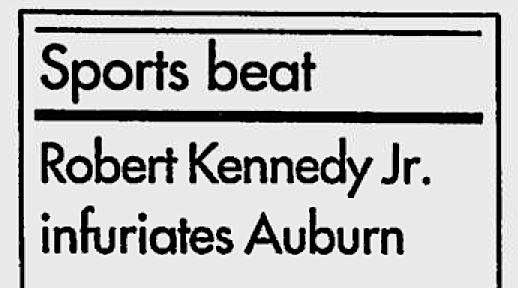 TIGERS NEVER FORGET: News of Robert F. Kennedy’s hate speech made the AP wire and appeared in sports sections across the south. That was the second sentence of Robert F. Kennedy Jr’s October 1993 speech at the University of Alabama. Of course it’s entirely possible it wasn’t just pandering. Kennedy apparently spent a year in Alabama in the late 1970s writing a biography of federal judge (and Bama grad) Frank M. Johnson (that’s currently going for one whole penny on Amazon). Maybe Johnson poisoned his mind. Maybe an Auburn woman spurned his advances. Regardless of the reasons, Kennedy’s comments didn’t exactly sit well on the Plains. To one Auburn businessman, it was a Tiger of an insult. “I have respected the Kennedy family over the years for what they did in politics,” J&M Bookstore proprietor, and then Auburn city councilman Trey Johnston told the AP. Uncle Teddy was no doubt disappointed as well. And Uncle John probably would have been, too. Preaching to the crowd is pretty much the m.o. of politicians and campus speaking circuiteers and such. George W. Bush opened his 2002 speech at Auburn with a Jumbtron-worthy “War Eagle.” Alabama wore Auburn jerseys. Kennedy eventually flip-flopped and said he was joking. The apology call to then AU president William Muse was probably painless enough. But the photo he sent (which we’d love to see if you happen have a scan or something)? 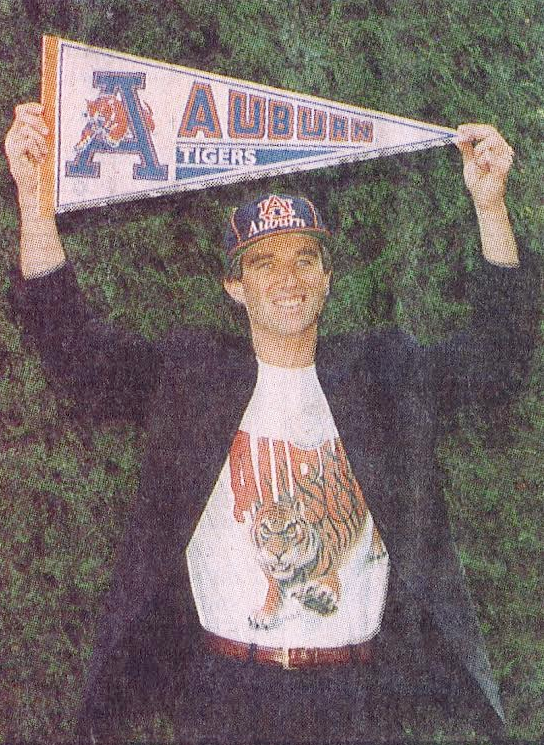 With him in an Auburn shirt and hat and waving an Auburn pennant? For someone who hated Auburn and would tell Auburn to its face he hated Auburn in Auburn, that had to hurt. Especially after the Tigers won the national championship. UPDATE: Ask and ye shall receive. Kennedy’s apology pic apparently ran in the papers, and TWER reader Mac Thurston clipped it out. I would have, too. It’s the most AU-kward photo I’ve ever seen. I’m pretty sure the “Officially Licensed” sticker thing is still on the shirt. Are we sure this isn’t a mannequin? What’s he staring at? Related: Teddy Kennedy posing with an Auburn Tiger (with an elephant dangling from its mouth). These cards provide various advantages to the customers. of the lenders to beg some urgent funds when the online way is open to you.